The award winning Mococo website is home to industry leading jewellery and watch brands including Thomas Sabo, ChloBo, Olivia Burton, Clogau, Swarovski, Chrysalis, Nomination, Daisy London, Alex and Ani and Vivienne Westwood. Take advantage of their beautiful fragranced gift wrapping to make your order extra special, and they even throw in a little chocolate! Priding themselves on impeccable customer service, Mococo have been awarded Gold Trusted Service Award 2017 from Feefo. You will find extensive gift guides on the Mococo website which will help you choose the perfect gift for that special someone. Make memories last with the engravable jewellery by Thomas Sabo. Mococo offer complimentary engraving on this collection to make your gift unique and meaningful. Capture your personal moments of happiness with the Sterling Silver personalised jewellery or indulge yourself with a personal treat from Mococo - Retail Jewellers E-Tailer of the Year 2017 and you will not be disappointed. 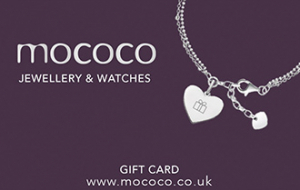 This voucher may be used in any Mococo store or online at www.mococo.co.uk. This voucher is valid for 2 years from the date of purchase. Monetary vouchers can only be exchanged for goods. This voucher may be used in any Mococo store or online at www.mococo.co.uk. This voucher can be used as full or part payment. No change will be given. Any residual balance will be transferred to a Mococo Gift Voucher and will then be valid for 2 years from the date which the transfer occurred. Vouchers are non-refundable. Mococo and In 1 solutions will not be held liable for vouchers which have been lost or stolen.